The MGJ2 series from Murata are 2 Watt DC-DC converters featuring high isolation with dual outputs housed in a compact form factor through hole package suitable for powering "high side" and "low side" gate drives in bridge circuits using insulated-gate bipolar transistors (IGBTs) and SiC & MOSFETs.. The MGJ2 series have an isolation test voltage of 5.2kVDC offering reinforced insulation to a working voltage of 150Vrms or basic and supplementary insulation to a working voltage of 300Vrms. The MGJ2 series is recognised to UL60950 and can provide a key element of the end-product's safety insulation system. The MGJ2 series are also recognised to the medical safety standard ANSI/AAMI ES60601-1, 1 MOOP to a working voltage of 300Vrms or 1 MOPP/2 MOOP’s to a working voltage of 200Vrms making them suitable for medical as well as industrial applications. The MGJ2 dual output 2 Watt series are packaged in an industry-standard SIP format, and have an ultra-low barrier capacitance of 3.3pF typical across the range. A choice of asymmetric output voltages allows optimum drive levels for best system efficiency and EMI, 17 models are available with nominal input voltages of 5, 12, 15 or 24VDC. For each input voltage there are various output voltage combinations available: +15/-5VDC, +15/-8.7VDC, +15V/-15V, -+17V/-9V, +20V/-3.5V or +20/-5VDC. Creepage and clearance distance is 3mm with DC link voltage 1.5kVDC. The converters have characterised dv/dt immunity, suiting reliable operation in fast switching applications and have an operating temperature range of -40°C to +100°C. Partial discharge performance has also been characterised. 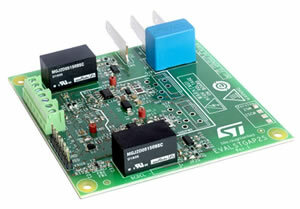 The MGJ2 series has also been selected for inclusion on the following STMicroelectronics isolated gate driver demonstration boards. 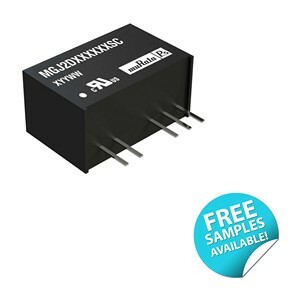 Anglia are offering customers FREE samples of the MGJ2 DC-DC converter series from Murata, please fill in the form below to request a FREE sample now.